Although pressure cooking can seem intimidating, it’s really quite easy. 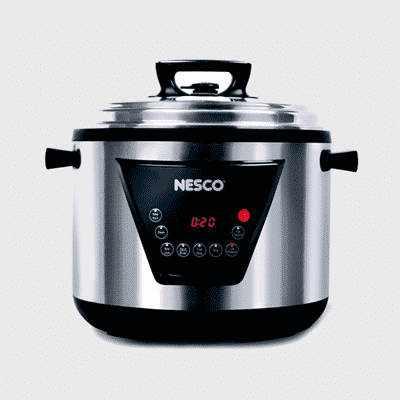 The NESCO® Pressure Cooker is sleek, safe and quiet. The NESCO® Pressure Cooker is equipped with several built-in safety features which will not allow the cooker to open while under pressure. Pressure cooking will totally change the way you plan and prepare meals. NESCO® Pressure cookers are a great way to cook food incredibly fast that will free up time for other things. Many dishes are one pot meals which further cuts down on cleanup time. It will make the food tastier and more nutritious because it seals in the vitamins and minerals.